So before I start my review I want to get a little bit sentimental. Angelfire was the first book I ever reviewed on this blog! If you want to see how much I loved that book check out my review here and mind you it was my first so my style has changed quite a bit since then. 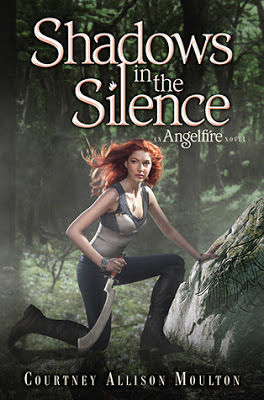 And then I reviewed Wings of the Wicked right around the time of my one year blogaversary which I loved as well and you can check out that one here. So it only seems fitting that as my two year blogaversary is coming up that this be one of the reviews to close my year out! And Courtney ended this series with a bang! He gave a little smile and I released his face. I walked to my bed, pulled back the blanket, settled into the firm mattress. I'm so sad to know that this series is over, but I also love when trilogies come to an end and we get the final story. OH, so excited to see you loved this! I just got a surprise copy of book 3 and I'm planning on tracking down the first two so I can devour the series all at once! I seriously can't wait to read this book. And that scene you posted . . . sigh. Now that's what I call super sweet! Lovely review! I haven't read any of this series. I'm not a big fan of angel books so I don't read many. This sounds like one of those series I would actually enjoy though. Great review!